Ricus Dullaert is an all-round antiques dealer. Ricus deals mainly in antique Russian and Greek icons, antique religious art, antique Dutch portraits, antique Dutch furniture and Dutch Bibles. From Ricus Dullaert you can expect a splendid collection, a wealth of knowledge, an international taste... Read moreRicus Dullaert is an all-round antiques dealer. 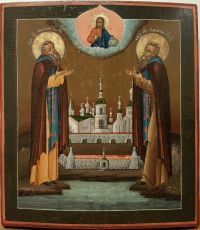 Ricus deals mainly in antique Russian and Greek icons, antique religious art, antique Dutch portraits, antique Dutch furniture and Dutch Bibles. From Ricus Dullaert you can expect a splendid collection, a wealth of knowledge, an international taste and years of experience.